Some homeowners believe selling without the aid of Realtor will allow them to price their home more attractively. They may even think ultimately they will net more money at closing. However, national statistics show that homeowners selling without a Realtor net as much as 25% less - a loss of four times what many Realtors charge in commission! Further, selling a home is not easy. There are a myriad of issues from complex real estate laws to the rigors of facilitating the actual sale. So what does it take to successfully sell a home these days? Consider the following: advertising, answering inquiries, scheduling showings, screening buyers, qualifying buyers, negotiating offers, following up with lawyers, title companies, banks, inspectors and appraisers. All in all, a daunting set of tasks and responsibilities. Also, what about those savings and increased profits? And why do the transactions take longer? We know how to price your property. Our goal is to get you the highest possible price for your property that the market will support; and all New York State Realty agents are trained and experienced property value analysts who can help you determine an appropriate asking price. Just call us or fill out our Market Analysis form on-line and find out what your home is worth today! We are real estate marketing experts. Utilizing the wide range of marketing media and techniques we provide will increase your chances of finding the right buyer for the right price. 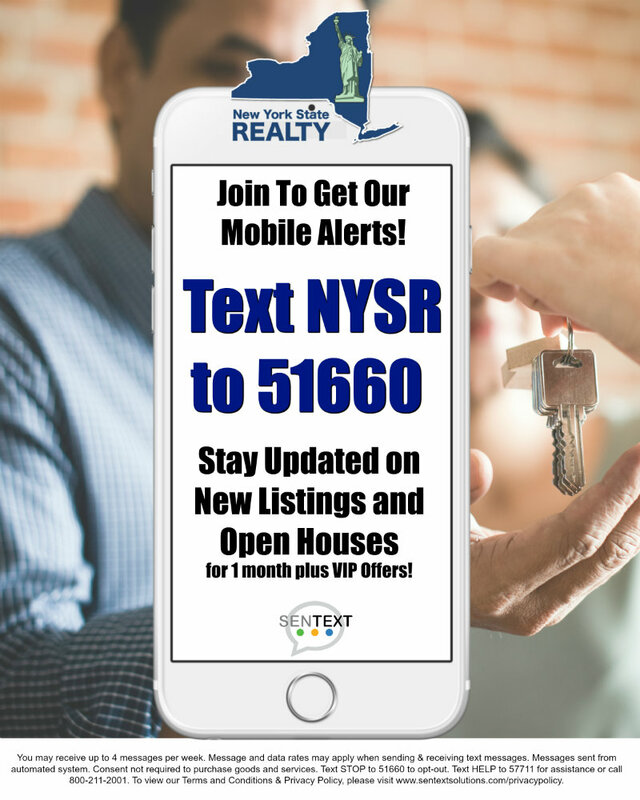 In addition to being members of the Western New York Multiple Listing Services (which also appear on Realtor.com), we can advertise your property in appropriate newspapers and local real estate magazines, feature it on our own Web site, hold open houses, and present it to pre-qualified buyers we already have. We understand the law. While our advice cannot legally substitute for that of an attorney, we can help guide you through the labyrinth of purchase contracts, title reports, inspections and appraisals, escrow accounts, disclosures and other legalities that can end up delaying the closing if not anticipated. We know what makes buyers tick. Getting the price you want for your home can sometimes mean making it more cosmetically appealing to potential buyers, and we can advise you on to simple ways to inexpensively increase its curb appeal. We handle all the calls. While you are at work, so are we, actively trying to sell your property. Instead of missing calls during the day, coming home to have to check your messages and answer inquiries, plus deal with showings and more calls and strangers appearing at your door without an appointment, you'll only deal with one agent who is sensitive to your schedule, can answer inquiries any time of day, and show your property at times you're not able to. Letting us screen your inquiries avoids missed opportunities and reduces wasted time and stress for all involved. We know how to match buyers with sellers. Due to our marketing efforts, more people will see your home than if you try to sell it yourself and greater exposure can get the price you want sooner. Out of all the inquiries we get on all the properties we have for sale, we will screen them for the prospects that are best suited to your home. We pre-qualify our buyers and advise them on financing. While we are legally bound to present all offers to you from any buyer, we can assist them with financial advice and becoming pre-approved for a mortgage so they know what they can afford before looking. Bringing you pre-qualified buyers saves not only your time, but theirs as well as ours. We handle the negotiating. Instead of finding yourself pressured at your own kitchen table to accept a low bid, we take all the offers and present them to you to consider carefully in your own time before making a decision. We handle the details. Once you have a purchase contract, there's plenty more work to do. We handle arranging visits from inspectors and appraisers, following up with getting contracts and forms to lawyers, banks, title companies, and so on, and a host of other legal details and procedures to ensure your closing goes smoothly. Whether you are selling a single family home, mobile home, condominium or townhouse, commercial or investment property, land, lots or subdivisions we can help you realize the maximum value of your property!